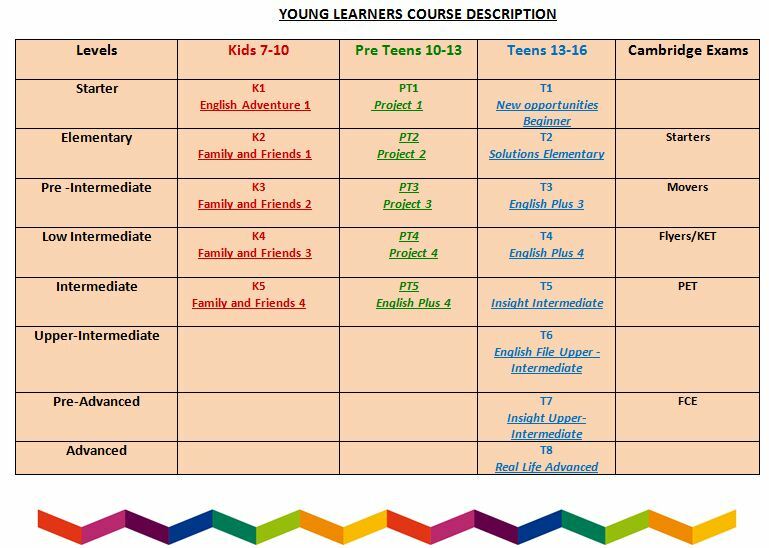 There are three parts to our Young Learner Programme which are divided according to the age of the learner. Times: Three 90 minute lessons, three times a week either Shift One- Monday, Wednesday and Friday or Shift Two- Tuesday, Thursday and Saturday. Classes are usually at 5.00pm although we can offer classes at 3.00pm or 4.00pm. On Saturdays the time of the class is agreed with the students. Length of Courses: Each course consists of 50 lessons and takes approximately 17 weeks to complete. Half way through the course there is a progress test and a mid term report which is sent home to parents. At the end of the course there is a level test. After the level test it is usually appropriate for the child to proceed to the next level. Levels and Classes: There are different levels of ability and experience within our courses. A young learner is placed on a level after completing a entry tests and a spoken interview. A child’s age is also taken into consideration. A child of 9, for example would not necessarily be expected to start at K1 where the children are usually aged about 7. Similarly a child of 12 is more likely to be placed at PT4 rather than at PT1. Other factors also influence which class a child is placed in. Factors include preference for a particular time and day as well as how many students have registered for the class. Courses start from a K1 level, which teaches the children the alphabet and basic vocabulary, and continue to K6 which is approximately a pre- intermediate level. In the classroom there is an emphasis on using spoken language, pronunciation, developing listening skills and learning to write the letters correctly. Reading is based around popular childhood stories and literature. We use the communicative approach at IH Tbilisi where every opportunity is used to maximize the use of English. We ensure that the children enjoy being in an English Environment and a variety of songs, stories and published materials are used to stimulate the children’s interest. At the end of each Kids level, Young Learners are presented with a certificate. In addition, at one point in the course parents are invited to an open lesson, where they can watch teaching and learning taking place. Courses start from PT1 level, an elementary level, and continue to PT4, which is approximately an Intermediate level. A significant proportion of the course is spent engaged in speaking activities and learning to communicate in different situations, however students are expected to complete some writing tasks. Project work and presentations form a core part of the work that is completed in the classroom. Courses start from T1, an elementary level, and continue to T8, an advanced level. Teen courses study grammar and vocabulary in depth and work on developing strong speaking, listening, reading and writing skills. Teens also have the opportunity to express themselves in English through completing projects and giving presentations. Intensive small group, or one to two or one to one courses for complete beginners or very young learners. These courses are becoming increasingly popular and we offer Cambridge FCE preparation courses and IELTS, TOEFL courses especially for Teens. Please ask or call our reception to find out the latest information about these or any of our Young Learner courses.